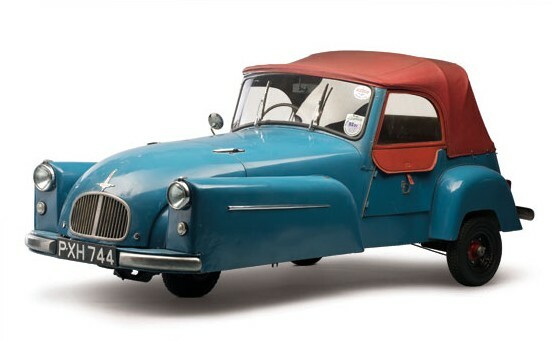 Only the Mark F version of the Bond Minicar outsold the Mark C – and it was by less than 100 units. In total, 6,399 Mark Cs were built between 1952 and 1956. The Mark C was a marked improvement in design and quality over the earlier Mark Bs – it looked more like a car from the front – and less like a rolling coffin. The style really fit in with the times. It used a 197cc single-cylinder making nine horsepower. There were various trim levels available – which also helped make this seem more like a real car. This one should bring between $10,000-$15,000. Click here for more info. This entry was posted in Uncategorized and tagged 1953, auctions, bond, cars, classic cars, microcars, minicar, mk c, rm auctions by classiccarweekly. Bookmark the permalink.